Adding a mirror to the garden is a great way to make a small space look bigger. This was me all day today — camera stuck to eye, as I toured some fantastic gardens in Buffalo, N.Y.
As one of the organizers of the National Garden Festival said, “Please let people know Buffalo is more than snow and hot wings.” And, so it is. Buffalo has some of the cutest, most intensely planted cottage-style gardens I’ve seen, in several places whole neighborhoods full of gardens open to the public during the Buffalo Garden Walk. This photo illustrates one of the ideas many of these cottage gardeners used: placing mirrors around the space to make it look larger. « Why Plant a Memory Garden? I love the snap! Seeing your reflection in the mirror is very cute! How awesome to view other people’s gardens! I wish I had thought to get a ‘self portrait’ in one of those mirrors. Great photo. I don’t blame you–I think I’d have had my camera permanently attached to my face, too, given all of the lovely photos you all are showing from this weekend! 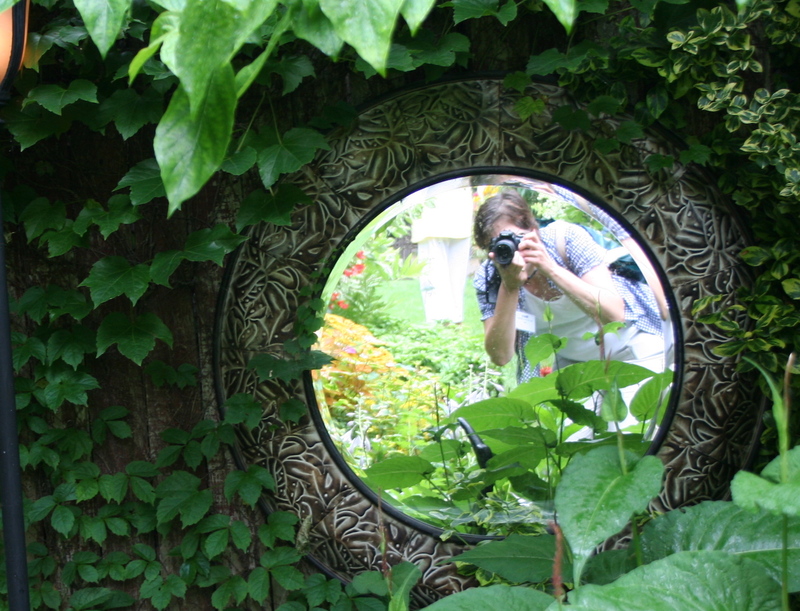 I need to remember to put mirrors in my garden- I love how it looks in this picture!